I have recently changed quite a few things about my skincare routine which have left me with much smoother and clearer skin. I thought I would show you what I’ve been doing and let you know the products both new and old that I have been loving. Also, as a bit of a side-note, I finally braved picking up Tom’s camera on my own so I hope you can see the difference in the quality of my photos. I am not at all gifted at photography so I am getting a lesson from him tomorrow on how to make my pictures better quality for my blog. Let me know what you think! Morning: In the morning, it’s still just a quick cleanse and to do this I use the Clarins One-Step Facial Cleanser on a cotton pad. This is a bi-phase formula which means you have to give it a good shake. It is quite light a refreshing on the skin and just removes any remaining grubbiness from the night before. Evening: My main focus in the evening is obviously makeup removal and I have recently ditched the makeup wipes for good and I am so happy I did! It has made such a huge difference to my skin! I have recently been loving Liz Earle Hot Cloth Cleanser for heavier makeup days as it really gets rid of every scrap of makeup and to be honest, I am just in love with the scent! It’s so refreshing! For days where I am wearing slightly less makeup I tend to opt for The Body Shop Chamomile Silky Cleansing Oil as it is so light and my skin is just so soft and clean once I have use this! 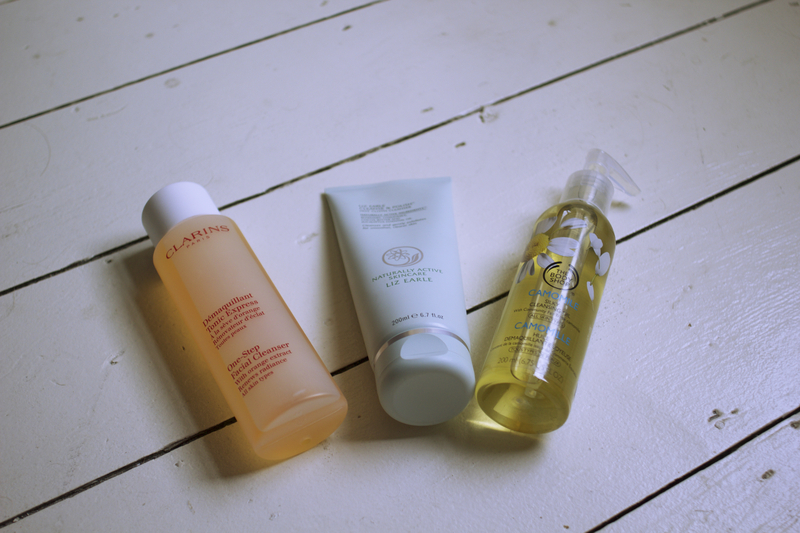 I have heard that you are meant to double cleanse in the evening so when I can be bothered, I give my face a quick sweep with the Clarins Cleanser too after removing my makeup. Morning: I like to keep everything quick and simple in the morning as I am usually still half asleep so I have recently been using the Oz Naturals Ocean Mineral Tonic* as a couple of quick spritz’s and your done. The scent is a little bit weird but it fades pretty quickly and I love the cooling feeling it leaves on the skin! Evening: Dependant on how lazy I am feeling I may just use the Oz one again but I predominantly use the Body Shop Vitamin E Hydrating Toner I mentioned this in my last skincare post (i’ve linked it in case you were interested to see how it has changed over the last two months) and I am still loving it just as much! It really is a great product and leaves my skin feeling really plump unlike some alcohol based toners that leave it feeling tight and stripped. I picked up my third tube of the Liz Earle Gentle Face Exfoliator in my recent haul and it is honestly my holy grail exfoliator. I will keep on repurchasing this until I find something better as it is just wonderful! I use this 2-3 times a week all over my face and sometimes down on to my neck too. It doesn’t dry my skin out and the scent is just wonderful! Very similar to the Liz Earle Cleanse & Polish! Sometimes I need a little extra scrubbing action around my nose though so about once a week I use the Soap & Glory Scrub Your Nose In It exfoliator which I picked up at the Boots staff shop. It is really grainy and helps to prevent and get rid of any existing black heads pretty well. It can be quite drying though which is why I only use it once a week maximum. I have only really been using one face mask the last couple of weeks and that is the Clarins Beauty Flash Balm I love how this tightens and brightens my skin and leaves it feeling silky soft. I use this once a week sometimes twice if I am feeling like pampering myself and I leave it on for about 15 minutes, or longer if I am killing time waiting for #ltbloggers like I was today! I use serums both morning and night before I apply my moisturiser and I am alternating between two at the moment. The first being the Clarins Hydraquench Intensive Bi-Phase Serum which I am in the process of finishing. I love this product and have gone through a full size and I am nearly through the half size too. I really do love this but it is quite pricey (over £40 I believe) and as a student I was looking for a slightly cheaper alternative. This leads me on to my new addition, the Body Shop Vitamin E Moisture Serum which comes in a hell of a lot cheaper at only £12! 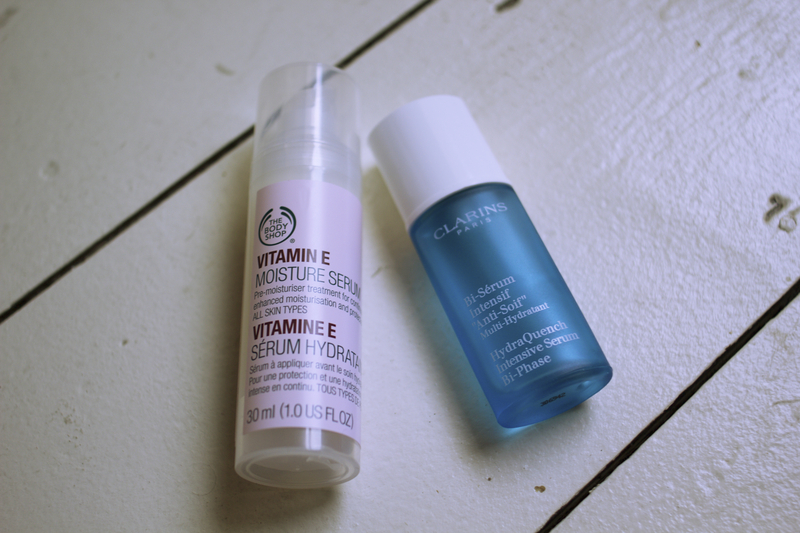 They are both meant to do the same thing, combat dehydration and give the skin a good moisture boost! I am really liking this too but the proof will be when I stop using the Hydraquench and see if it keeps up my hydration all on it’s own! 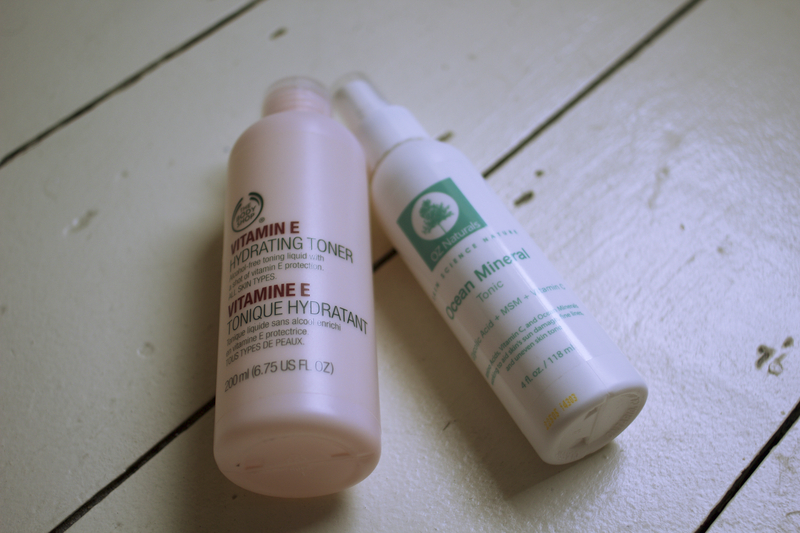 Morning: I have been alternating between two different options from the Body Shop Vitamin E range. When I am applying makeup that has an SPF in it already, I am opting for the Vitamin E Aqua Boost Sorbet which doesn’t contain any SPF. It is a light, gel texture that is very cooling on the skin yet still gives it that worthwhile moisture boost. A little goes a very long way and I love it! If I am going eau naturale or I am going to be in the sun for a long time, I am using the Vitamin E Moisture Lotion which has SPF 15 in it. This is amazing as it leaves my combination skin neither oily nor dry. Perfection! Evening: The lovely lady in The Body Shop recommended I get a specific night cream to treat my skin over night. 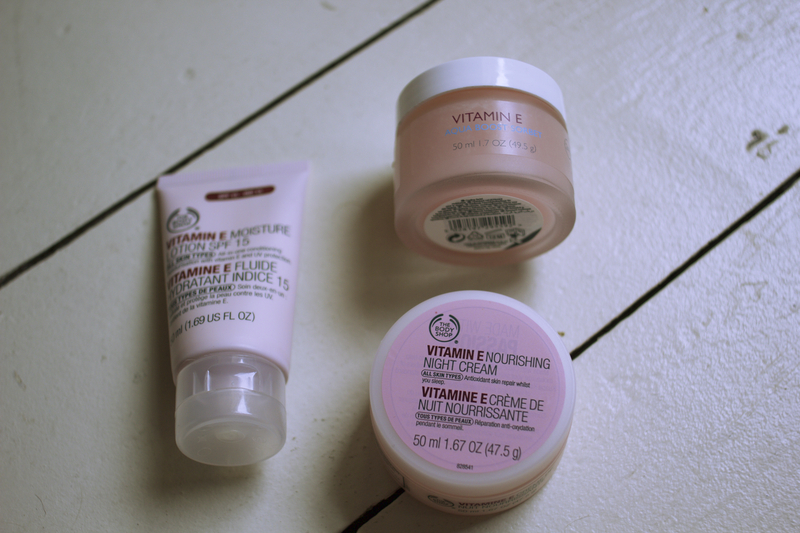 I have been using the Vitamin E Nourishing Night Cream and I have been really enjoying it! It is thick but doesn’t feel greasy. They do do an intensive night cream but I felt like that would be too heavy for my skin, particularly leading into the summer months. This is lovely and soaks in really well so you don’t fear that you are going to smudge it straight into your pillow when you go to sleep! I am really happy with my skincare routine at the moment and my skin seems to be loving it too! It is so much brighter, clearer and I have been getting way more comments on how good it looks which I am really liking as earlier on this year I had been getting very self conscious about my skin what with the blemishes and the ridiculously scaly dry patches! It’s nice to have a more ‘normal’ type of skin now, whatever normal actually is! Do you use any of these products and do you think there is any product I am missing in my regime? P.s Please follow me on Bloglovin’ and Twitter! I hit two milestones today – 100 followers on Bloglovin’ and 200 on Twitter so thank you very much! Hugs and Kisses all round! Nice to see you like the Body Shop Aqua Boost Sorbet, one of my favourites! 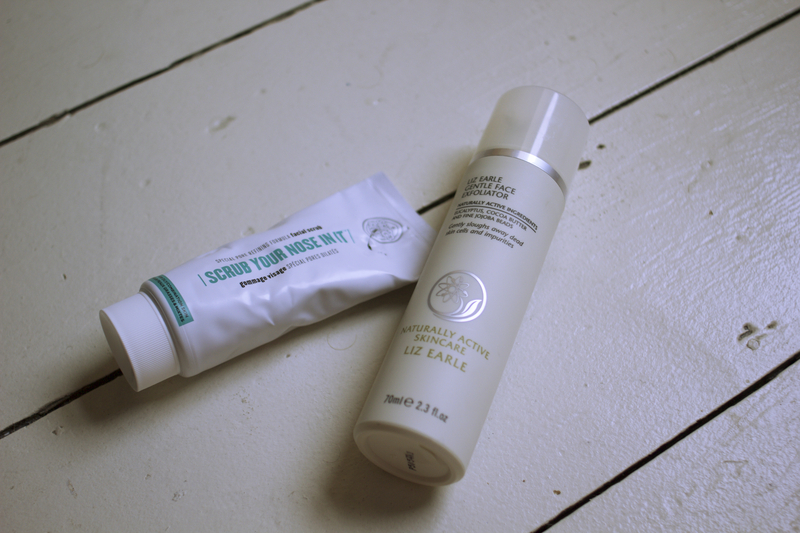 I really need to try the Liz Earle Exfoliator, sounds fab! I’ve got high expectations now haha! 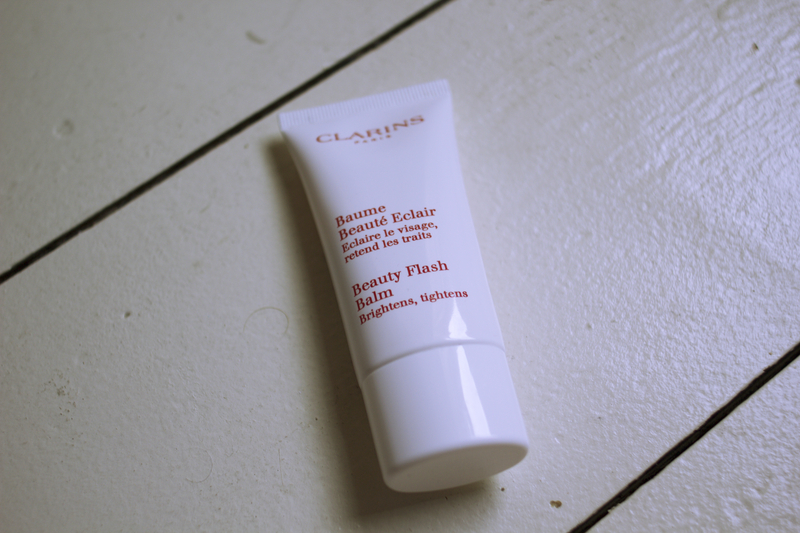 Do you only use the Clarins Beauty Flash Balm as a mask? I’ve used it as a primer of sorts and it does provide a luminous surface to my skin. I had the Vitamin E Aqua Sorbet when they first launched it and I didn’t care for it – it irritated my skin due to the menthol in the product (burning). I ended up using it up on my body (I also did buy the body sorbets and they were hydrating enough for my liking). I’m using the Body Shop Vitamin E serum right now – it’s pretty good. Let us know how you get on with it!